Happy New Year! Welcome to the new followers! If you don’t already follow me, click the “follow” button in the top toolbar. I have made a commitment to blog at least once a week. Tuesday will be TWO TIP day and as quilty things happen, you will also find more posts. There are several designers gearing up for another blog hop. As soon as the details are finalized this week, I will let you know. #1 – if you are not going to finish it…give it AWAY! Someone in this great quilting world will take it! The book and kit above have lived with me for a lot of years. However, I as much as I love it, I doubt I will take the time to make it. Respond to the question I gave above and I’ll put you in a drawing to win the book and kit. Responses must be submitted by midnight EST Friday, 1/9. I really like my flower garden, so I won’t be giving it away. I need to get it out and FINISH it. See a peak below, all homespuns! 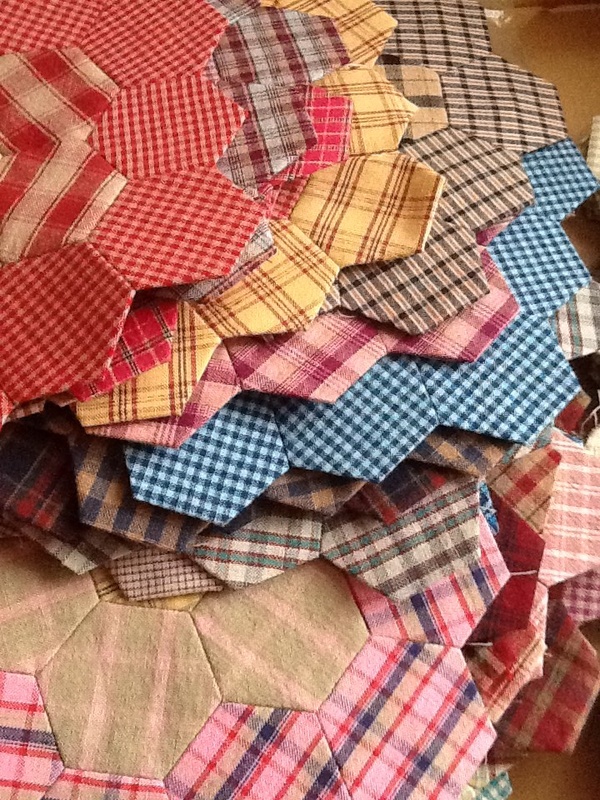 I think my homespun hexies may sneak into my suitcase for Albuquerque! The AQS Quilt Week is next week and my handwork classes are both on Friday. There are still spots available! 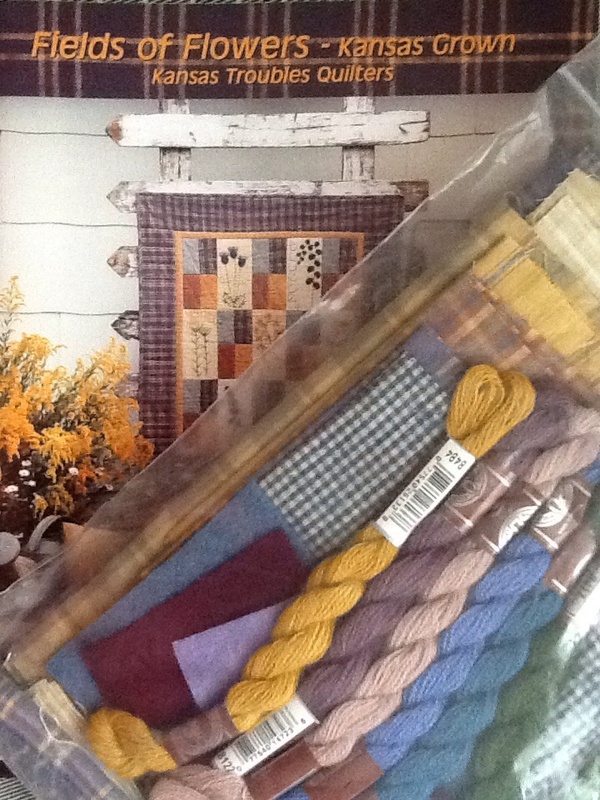 “Stitch It Slow” and “Hexies and Homeycombs”. Sign up on the AQS website or once you are at the show. I hope to see you in class! I need to get back to some prep for another UFO. (This one is only a year old!) I’m cutting strips for a string quilt. In cutting strips I want to be sure the strips are nice and straight, NO “V” cuts. Some use their cutting mat to square, I don’t. I use my ruler. I love my 8 1/2″ x 24″ to straighten the edge. 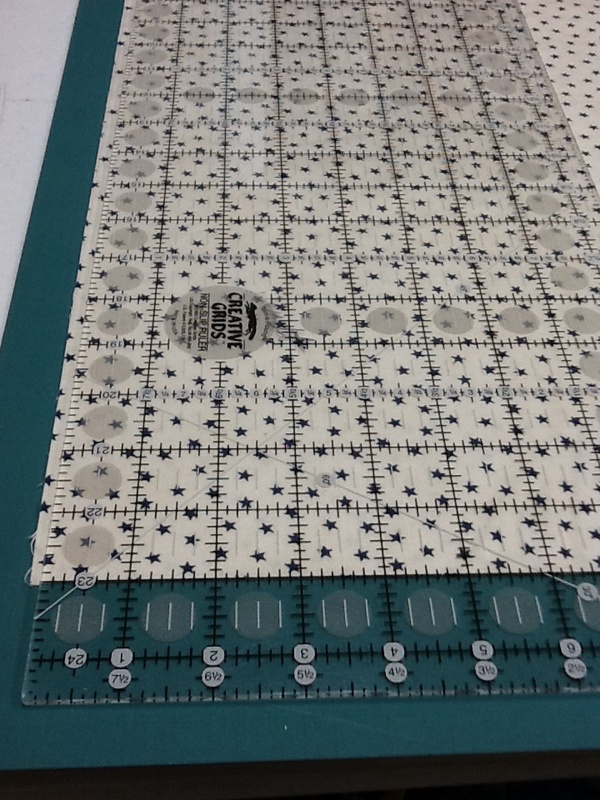 #2 – Straighten fabric for cutting strips by placing a ruler line along the fold. 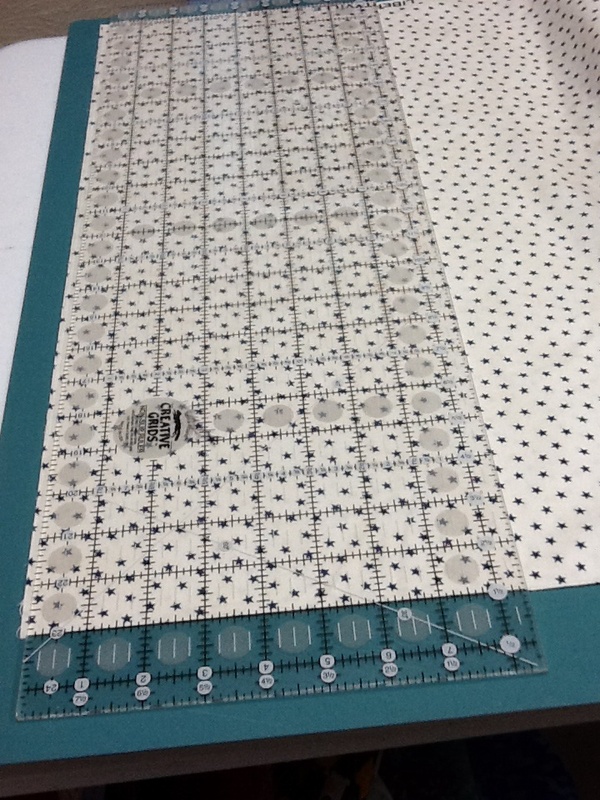 This takes the guesswork out of using a mat’s cutting lines. See photos below. Align a ruler line along the fold! If you are left-handed, you can cut down the left edge…if right-handed, walk around the table so you are on the opposite side and can cut along the right edge of the ruler. Until next week! May all your cuts be straight and projects nearer to completion!